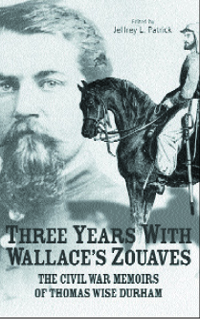 The unique memoirs of a Union soldier in Lew Wallace’s Zouaves in the western theater of the Civil War Jeffrey L. Patrick, editor This is a collection of the edited memoirs of Thomas Wise Durham, an enlisted man and officer in the 11th Indiana Volunteer Infantry (Wallace’s Zouaves) during the Civil War. Lewis Wallace, Hoosier soldier, statesman, and author, raised the 11th Indiana at the beginning of the war as a three-month unit. At the end of that initial enlistment period, the regiment was reorganized for three years’ service. While with the 11th Indiana, Durham participated in several of the war’s most important campaigns, including Forts Henry and Donelson, and Shiloh, and Vicksburg. This book will appeal to anyone interested in the western theater of the Civil War, soldier life, or Indiana history. Durham’s memoir is a well-written and detailed account of his experiences as both an enlisted soldier and a company officer in the Union Army, with valuable descriptions of combat, camp life, and encounters with fellow soldiers and civilians. Durham wrote with candor and seemed to avoid exaggerating his role in the events he describes. As Durham explained it, the piece was intended for his family’s enjoyment and not for publication, “to portray the joys and pleasures and sorrows, hardships and sufferings of a soldier in that war.” Although some minor mistakes appear in his memoir, Durham obviously strove to make it as accurate as possible. Despite the fact that a number of soldier memoirs and reminiscences have been published in the past several years, few have dealt with the vitally important campaigns west of the Appalachians. In addition, practically nothing about the famous 11th Indiana regiment has appeared in print for decades. Thomas Wise Durham’s extraordinary memoir of “ordinary” soldier life stands as a significant contribution to the genre of Civil War memoirs.